VECON™ is a powerful 2D/3D VSP and surface seismic survey design and modeling system that makes completion of a variety of difficult jobs extremely efficient. Designed for any level of geoscientists, VECON features a fast, accurate, intuitive and easy-to-use toolkit for working on site, remotely through Internet, or in a workstation environment. VECON™ imports models in a variety of other program formats and can handle arbitrary coordinates systems. Imported models geometries can be rotated to local N/S coordinates for efficient raytracing. Large reservoir models can be cropped around the area of the well or specific area of interest to reduce model size and improve performance. Seismic section or any structure image can be displayed as a base reference for building velocity models. Structural building features include layers, faults, and objects, which are all interactive for editing. Using VECON, you can build complex subsurface models in a couple of minutes, and shoot rays in seconds. A 2D & 3D full wavefield finite-difference method is available for acoustic, elastic and anisotropic media. 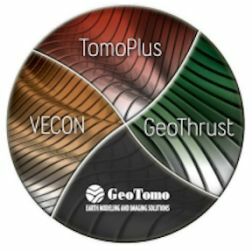 VECON™ provides options for building 3D velocity models from 2D cross-sections, from the layer or object interface maps supplied by the clients, or digitizing contours on the plan view. The user can import a 2D project directly into a 3D project, or convert a cross-section from a 3D project to a 2D project. 3D raytracing is designed for direct rays, reflections and converted reflections. 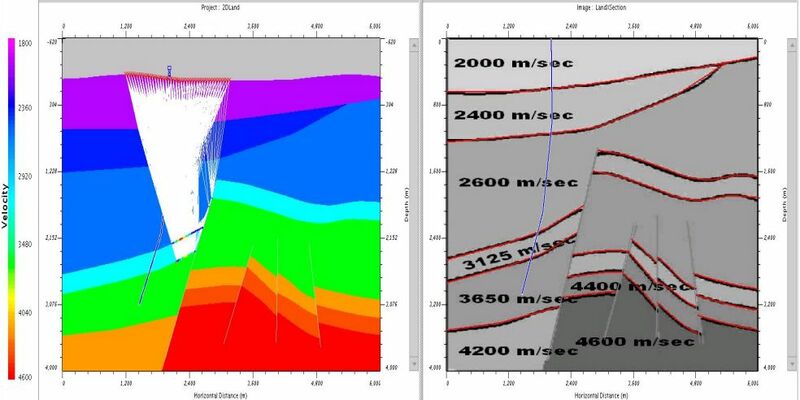 Ray coverage and fold plot are provided for survey design analysis. The source and receiver coordinates of your survey design can be exported to a SPS file for fast and easy hand off to the data acquisition team. VECON™ is designed for Windows, Linux, and Unix. For any evaluation request, please contact us below.